AMERICAN carrier JetBlue is expected to add Guyana to its international routes in early 2020. 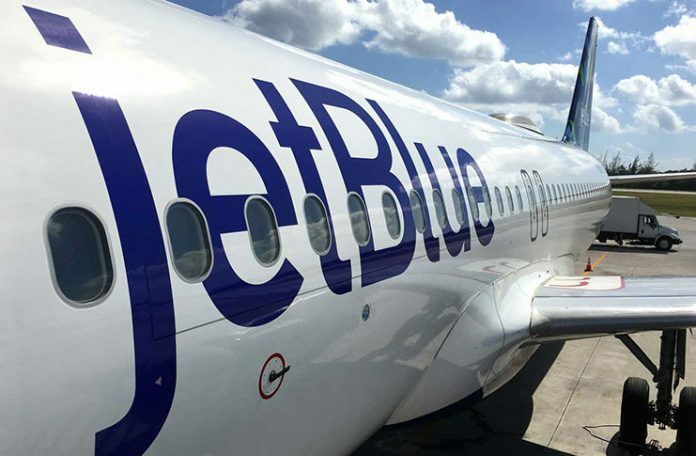 Reports are that company executives discussed several routes with which the airline will be establishing itself in the months ahead and, on Wednesday, JetBlue officials discussed the lucrative nature of the Guyana-New York route. JetBlue sources told Guyana Chronicle that officials are brainstorming the type of aircraft to service this route. In January of this year, Minister within the Ministry of Public Infrastructure, Annette Ferguson, told reporters at a press briefing that the airline is among several which have indicated an interest in entering the Guyanese market. “They are in contact with the Civil Aviation Authority to ensure that the necessary paperwork, documentation that they have to submit is handed in,” she said. The carrier, which was established 20 years ago, operates flights in the US, the Caribbean and Latin America. On Wednesday, the company announced that it will enter the London market, the first time the air carrier will be flying to Europe. The airline’s entry into the Guyanese market is expected to be welcomed by travellers who have been battling high ticket costs for years. Another carrier, American Airlines, is already operating flights here, between the Cheddi Jagan International Airport and Miami. Since petroleum was discovered in Guyana in 2015, a number of international companies have expressed interest in doing business here. American oil giant, ExxonMobil, is currently undertaking preparations for commercial extraction of oil, which is expected to occur during the first half of 2020.